a delicious traditional Italian antipasto in its vegan version: vegan stuffed olives balls! Today I would like to introduce delicious traditional Italian antipasto (starter), in my very own vegan version: stuffed olive ascolana style. Trust me these will be appreciated and devoured by anyone that doesn’t hate olives! A real treat and good both cold or warm, served with a fresh salad and a slice of lemon. 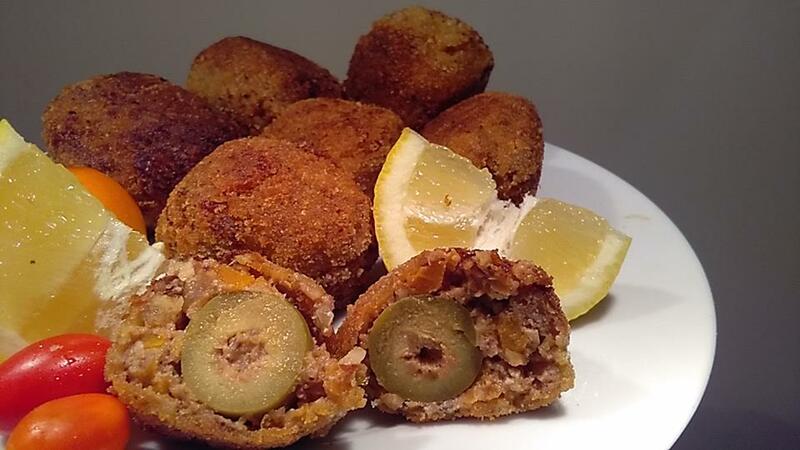 Ascolana stuffed olives are a traditional street food in central Italy (Marche region) and typically meat based. They used to be one of my favourite snacks in my past life as an omnivore, and I am very excited with the results of this olive ascolane vegan version recipe. So let’s get started with a few photos of the process and below I will add the recipe with the printable version for a more practical use. So the first thing is to grab a jar of pitted green olives, I just grabbed a quite large type at the supermarket next to my workplace. Drain the liquid off and with a knife start cutting across each olive in a sort of spiral motion but still keeping it whole. This will create more room to fill the olive with goodness. Once done, put aside and start preparing the vegan filling for this yumminess. 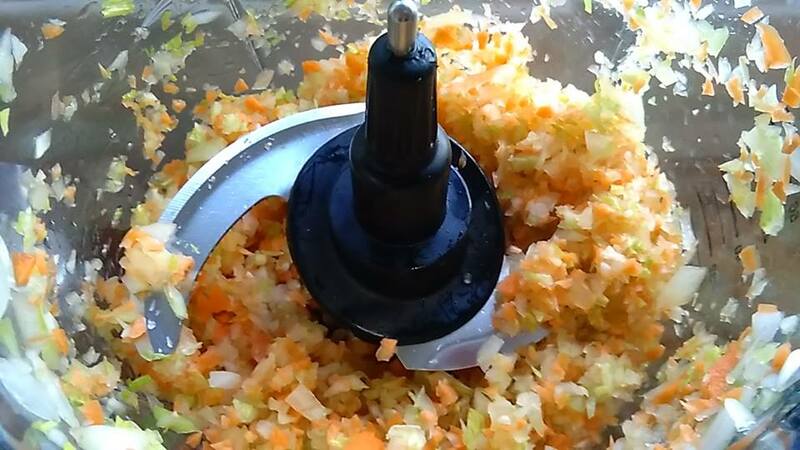 Start by finely chopping the base made with celery, carrot and brown onion in a food processor. This is a combination that I use often when I make red or white sauces as it always wins. Heat some olive oil in a large sauce pan and add this base on medium heat until brown while you continue with the next step, just keep an eye on it as you stir every now and then. You will still need your food processor now, for the second step: place half block of extra firm tofu, 100 grams of hazelnuts, 50 grams of walnuts, salt to taste, pinch of nutmeg and 3 cloves (spices) in the processor. 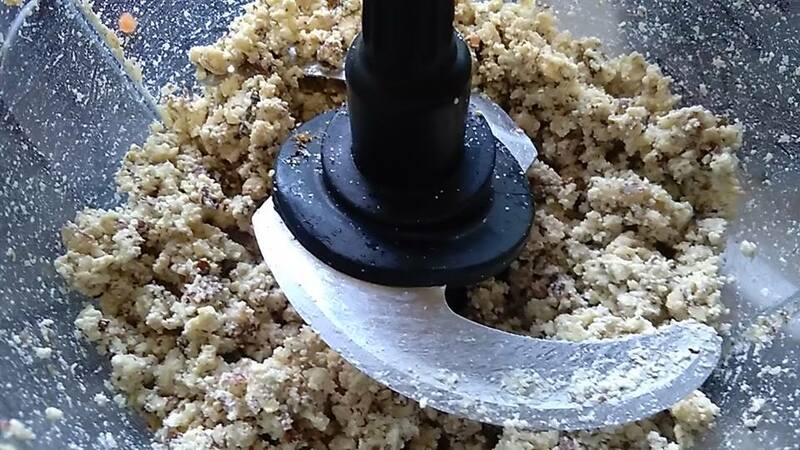 Blend to obtain a crumbly fine texture as pictured. Now you can clean the food processor. Just kidding. Just put it in the sink for your husband to take care of it later (at least , that’s my bad habit – sorry my love). Now just pour this filling by mixing it with your base in the sauce pan and keep cooking on medium heat for about 15 minutes and add a glass of dry white vegan wine first, let it evaporate then add about a glass of water and two tablespoons of tomato purea. Stir until absorbed and quite dry. In New Zealand the brand Peter Yealand is vegan and quite cheap, I used this brand. Adjust the salt, add pepper and more nutmeg if you like. 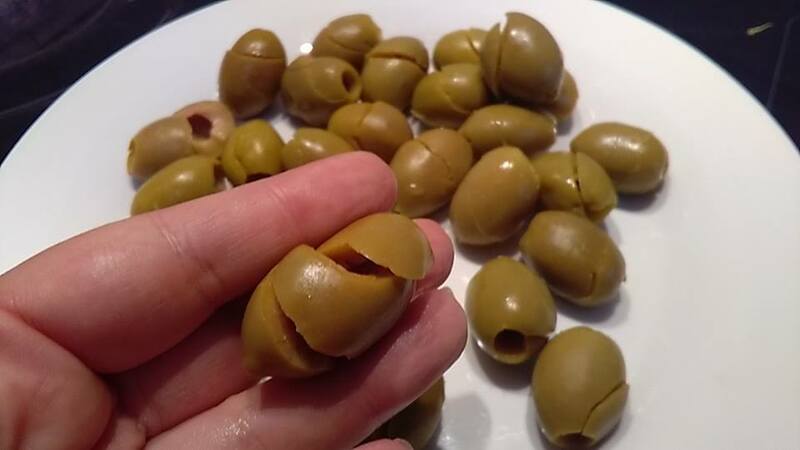 Once all dry and cooked (approx 15-20 minutes) place it next to a window and let cool down a little as you will need to use your hands to create the little stuffed olives balls. Once cooled down, add about half cup of breadcrumbs in the mixture and mix a little. This will make it even drier and easier to mould around the olives. I had thought to add some nutritional yeast too but eventually forgot. I don’t think it’s necessary as very very very tasty. I couldn’t help tasting a couple of time some of the filling before preparing the dish. Maybe a bit more than a couple of times! Now, before filling the olives (fill them and mould them as if they were little falafels) and rolling them into breadcrumbs for filling, I created my ‘eggy’ emulsion first, so that I could dip each filled olive into and then roll into breadcrumbs. I used: two tablespoons of white flour, 1 tablespoon of tapioca flour and salt to taste mixed with half glass of water. It will have the consistency of double cream. Dip each filled olive into it and then into breadcrumbs before frying in a hot pan with your preferred frying oil until nicely gold and crispy. And now the frying fun begins: fry the olives in a large non-stick pan until the external coat is nice gold and crisp. Let cool on a couple of sheets of kitchen paper and serve with a nice fresh salad and lemon slices. I hope you enjoy! I would defintely use the filling also for: stuffed pasta such as ravioli, lasagne filing, pasta sauce by adding also mushrooms and tomato sauce. It’s a winner! The baked version will work just fine I think, I am going to try and keep you posted. Don’t forget to share this recipe with your omni friends, let’s turn the world vegan with yummy food! a jar of pitted green olives, any size will do. Don't get spicy of garlic green olives, just plain salted ones in brine. half block of extra firm tofu (approx 100 grams). No need to press. heat some oilve oil in a large sauce pan and add this base on medium heat until brown while you continue with the next step, just keep an eye on it as you still every now and then. Now just pour this filling by mixing it with your base in the sauce pan and keep cooking on medium heat for about 15 minutes and add a glass of dry white vegan wine first, let evaporate then add about a glass of water and two tablespoons of tomato purea. Stir until absorbed and quite dry. In New Zealand the brand Peter Yealand is vegan and quite cheap, I used this brand. Adjust the salt, add pepper and more nutmeg if you like. 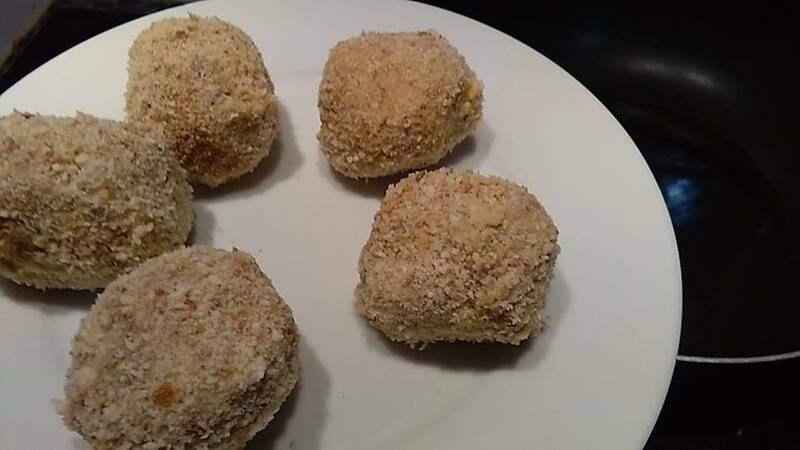 Once all dry and cooked (approx 15.20 minutes) placet next to a window and let cool down a little as you will need to use your hands to create the little stuffed olives balls. 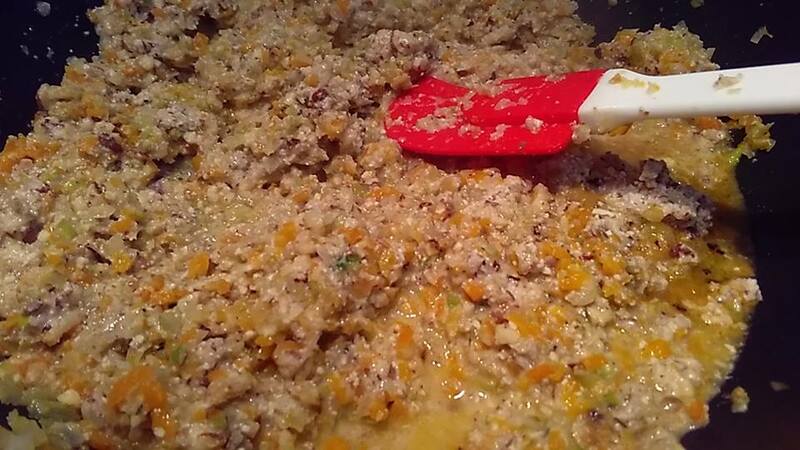 Once cooled down, add about half cup of breadcrumbs in the mixture and mix a little. This will make it even drier and easier to mould around the olives. I had thought to add some nutritional yeast too but eventually forgot. I don't think it's necessary as very very very tasty. I couldn't help tasting a couple of time some of the filling before preparing the dish. Maybe a bit more than a couple of times! Now, before filling the olives (fill them and mould them as if they were little falafels) and rolling them into breadcrumbs for filling, I created my 'eggy' emulsion first, so that I could dip each filled olive into and then roll into breadcrumbs. I used: two tablespoons of white flour, 1 tablespoon of tapioca flour and salt to taste mixed with half glass of water. It will have the consistency of double cream. Dip each filled olive into it and then into breadcrumbs before frying into a hot pan with your preferred fryng oil until nicely gold and crispy. 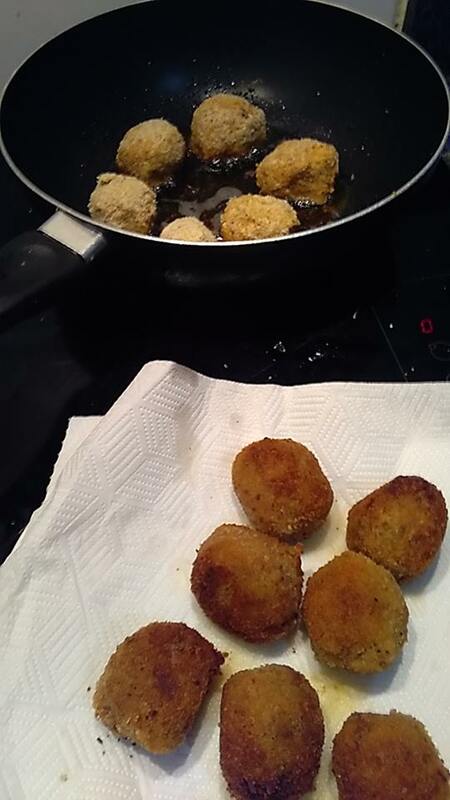 And now the frying fun begins: fry the olives in a large non-stick pan until the external coat is nice gold and crsp. Let cool on a couple of sheets of kitchen paper and serve with a nice fresh salad and lemon slices. I hope you enjoy!